The Galapagos Legend, with capacity for 100 guests, was extensively refitted in 2017 to better enhance your Galapagos experience. As well as being the fastest cruise ship operating in the islands, she remains the only vessel with an onboard pool. Fast, sleek and beautifully appointed, she retains a cozy, homely and intimate atmosphere. Her classic, yet contemporary interiors perfectly balance the huge open deck space. We have upsized and renamed our biggest and most comfortable cabin. One of the most striking aspects of our ship: 17 top of the line Balcony Suites located in the Sky Deck and the Moon Deck. Featuring big panoramic windows to admire the landscape. 24-hour coffee & tea station. Charles Darwin Panorama Lounge bar. The land iguana species has its origin in a common ancestor with the marine iguana, about 10.5 million years ago. The blue footed booby is native to the tropical regions of the Pacific Ocean and is part of the six species of boobies. The most common one is the Galapagos sea lion (Zalopus wollebacki). The frigatebird is widely spread on the coasts of South America. There are two species in the Galapagos: the Magnificent and the Great frigate bird. The Galapagos green sea turtle is similar to the common green turtle; however, the Galapagos green turtle has been considered a different species because it lives and nests only in the archipelago. The red footed booby bird has two morphs of colors in the Galapagos. They can be mainly brown or white. The red color of its feet can only be seen when they are not flying. The marine iguana is the only marine species of lizard in the world; it has changed its behavior, diet and physiology through natural selection during thousands of years. The Fur Seal is the second species of sea lion, that can be found in the archipelago. The nazca booby bird is found in the Eastern Pacific region of the Galapagos. The Galapagos Hawk is endemic to the Galapagos and is similar to the red tailed hook that can be found in North America. Mockingbirds in most regions of the world are known for having the ability to imitate the singing from other birds and several other kinds of noises. This cormorant bird is endemic to the Galapagos and is only found in Fernandina and Isabela Islands where the oceans high productivity assures their existence. This bird is endemic to the Galapagos Islands, and the largest colony of the world is located on Española Island. If you would like to extend your time in the Galapagos Islands, feel free to combine as many itineraries as you wish to suit your curiosity: 3, 4, 7, 10 and up to 14 nights are available. 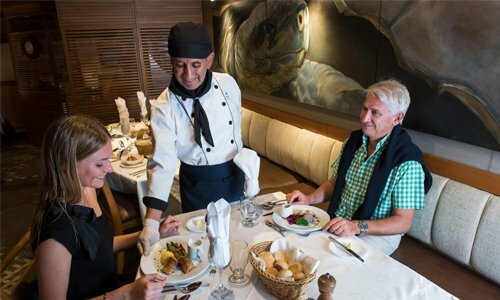 The perfects vacations start just by the time you arrive on board the Galapagos Legend, exquisitely designed, the staff will be ready to receive all our guests with a refreshing cocktail. Then, there will be time to settle and accommodate all our guest in the 100-guest cruise vessel. All our cruise ships operate in accordance with the requirements of the International Maritime Organization guidelines. GO Galapagos complies with the International Safety Management Code which aims to guarantee the marine safety and protect the environment. Also, we operate under the National Legislation to preserve the Galapagos Islands. The ship’s crew before boarding is required to show their certifications upon entrance on the Galapagos National Park. Such certification entails several emergency drill exercises and scenarios for emergency situations, including the evacuation of a ship. All of our cruise ships have lifeboats, life rafts and preserves for each person on the boat, as well as for additional capacity. Crew and staff are exceptional! Have loved every day and every minute. Thanks for an incredible experience!!! Thanks to all the cruise team, excellent trip for us and our kids!!! We had a wonderful time! The crew were very personable and profesional. Thank you! Enjoyed every minute and would highly recommend to all of my friends and family. Every single crew member was unfailingly courteous and professional. Thank you for a wonderful trip.